I never said not leveling and gearing, but developing with an intent. If you goal is to be competitive in TW, you are focusing development on certain teams to counter or have a good defense. That doesnt mean you stop developing, or slow developing, but you do focus. I know many players that are TW focused that have a great ewok team. It's not a common team or faction to be developed, but they are useful. It all follows the spirit if the development game, but it is not development for developments sake. That just inflated GP for things like TB. There’s a downside to this for the strong PVP player too, though. By all rights, the PVP-focused player should be playing or better rewards, against stronger competition, than the collector. The guy I’m playing against has more twice as many G12s as I do. His roster is really impressive! Why in the world should he be satisfied with the same range of possible rewards that I would be? Give him better competition and let him get better rewards! Give me fair competition and I’m happy to settle for lower rewards. This would be true if GP was approximately linear in the number of development choices made. However it isn't. That's because level is not equivalent to ability and so on. But each ability is equal (with zetas counting more). Toons are worth what they are worth based on the sum of all those factors, some are worth more by having more abilities. But the whole scale is equal for each player. Edit to add: isnt it linear? It's just the sum of multiple linear inputs. Abilities, zeta abilities, levels, gear levels, and mod dots. Each one of those is it's own linear scale. Your first paragraph is incompatible with your upcoming sentiments. As you know this topic is about fluff our rosters contain and currently method of basing matchmaking purely on GP is completely unable to take it into consideration. Therefore it leaves it to purely chance if the matchmaking is appropriate or not. Agreed with all else you said. It will never be possible to adjust the algo regarding -actual usage potential of the toon- and nor desirable on my part. If I don't have Revan it's on me. Taking #of raids completed is a good idea since it takes into consideration the playing duration of the player thus indirectly causes currently useless toons to be similar. It's like buying a house. The GP of a house is the volume. So a one-story house with high ceilings might have the same GP as a two-story house. But the amount of room you have is really affected by square footage. TW and GA measure based on volume, but it's not like people can use half the space. A realtor would use square footage to match people to a home, not volume. Are people just being rewarded for roster depth? Clearly, in a measure of GP, they have the advantage over people with broad rosters because a limited number of teams can be used. If that is the intent, fine, but don't call it a match based on even likelihood of winning. He will beat me and he will get better rewards. It’s already as if we’re in separate brackets: his bracket guarantees him 35 slicing mats minimum, and mine guarantees me 15 slicing mats maximum. Those will be our rewards no matter what we do. That’s boring. He’d be having more fun if he was facing better competition, and if a good performance could actually net him better rewards. I’d be having more fun if I was facing more appropriate competition, and if a particularly bad performance on my part could actually result in me losing out on some rewards. There is nothing at risk in this matchup. It’s pointless. We could just send the rewards to the mailboxes the second we were paired. That can’t possibly be the intent of this game mode. Why not? That should be the intent if it isn't currently, that's sensible design; trying to put 2 opponents with as close likelihood to %50 chance of winning on paper. If I'm facing an opponent with twice my character GP (exactly how my current match up is), why bother putting up defense or attacking him? I'll sign up for GA and then not participate and collect loser items. The other opponent will just lose "fun" and be bored by not having anyone to play against. So you're saying anyone who invested resources into ships automatically loses? GP seems too obviously inaccurate to me to think that matching opponents evenly is their intent. Or maybe they just ran out of time in their development cycle to make something more sophisticated. You never said not gearing and leveling. But you dont need to, just like with zombie , its obvious to anyone who read the description, not gearing and keeping it weak was better. How is this any different. Keep most of your roster weak and get better opportunities in the arena. And before you say wins and losses count, thats only after your grouped by GP. Inflated GP. But i guess they just made bad choices helping their guild. From a more practical perspective. I have an arena shard mate with a super lean roster. We are both ftp and have done fairly similar in arena. Based on that it is fair to say we have made a similar amount of development choices. His roster is super lean and would probably win against mine in GA. That is fine, he has made better choices (for this purpose). However his GP is about 25% lower than mine. Will ships be 50% of the GA banners? Or like TW where it's just a couple banners? If there's more emphasis/banners for squads, then players who have invested into fleets will be at disadvantage because they are counting total GP instead of the actual/active GP that's possible to be used in GA. If they only added up top 30 characters GP (for 3x5 vs 3x5) and top X ships GP, then it would be 'fair' as they want - that would require both synergy teams, strategy, and resource management skills. It would also produce more competitive battles to really know who's the best - rather than the person who has ignored fleet winning all the time because the fleet banners/battles will be fewer banners than squad battles. I think we made enough illustrations in the topic already. I leveled everything to max, maxed out as much abilities as possible, geared them 7&8 lowest, put maxed mods on everything. This has zero impact on the usable portion of my roster and I still have 140M credits I can't spend. Now can you say I didn't make best use of my resources? How so? However if I knew CG would take the easy route out, I would keep everything that's not of immediate use untouched to game the lack of foresight of the current system. That's not in spirit of gaming. Neither on my behalf, nor as designers of the game. Then at the very least, the matchmaking should be good enough to make the player’s respective strategies matter. But it isn’t. That’s the point. It doesn’t matter how I deploy my resources in this matchup. I am going to get rolled no matter what. I’m specifically saying that I want strategy to matter. But it never will if the matchmaking is this bad. Raw GP means nothing , except of course in the grand arena matchmaking, where it means literally everything. However their matchmaking works, it should definitely try to only match rosters which are equally good at the GA format. It would make no sense to match that way, then have the "bad at PVP" winner get the same prize as the "good at PVP" winner. There has to be some factor which allows the people who have focused on PVP to have an advantage over people who have focused on other aspects, like collecting or TB. How about this: Give each person a GA ELO rating. This first GA is based only on GP. Future GA "seasons" are based on GP _and_ ELO. Have prizes scale up based on the ELO of the bracket. After a few seasons, the matchmaking would be more equal, while still rewarding folks who have made PVP a priority. That comment was made in response to somebody complaining that the guy he attacked in arena was somehow cheating since his team with a lower GP won. Raw GP means nothing in the context of that thread. Obviously it has an impact in other areas of the game, even before GA.
Kyno, I think the issue is that you seem to be assuming that Player X and Player Y who are equal in GP have equal resources, and X may have spent those resources on maxing out TW teams while Player Y has used the same resources to be a collector and spread them out across numerous toons that are less useful for TW/GA. I would argue that this is not true at all--the HSTR/tank-level resources needed to max toons out are far different from the pit-raid/challenge gear level resources needed to bring toons to gear 8/9 or so. Someone in a long time HSTR guild may have the ability to g12+ dozens of toons, while a long time player without such resources will have far fewer g12 toons. In reality, it wasn't about the choice to focus on TW teams as much as it was about the resources available to those players. And of course a strong g12 toon is worth more than 100 g8 toons in GA. I personally have worked on competitive TW squads and I have a fair matchup, but I do not think GP is a good way to match people. I try to bring my weaker toons to g7 or so for TB purposes--I don't think this should hurt me in GA matchups. To gear these toons to this level I'm not sacrificing any useful gear that would help my TW squads, but this strategy will hurt me in the GP matchmaking system vs someone who leaves their trash toons at lvl 1 g1. Anyway, I agree with your suggestions on using number of g12 toons, raid completions, etc. 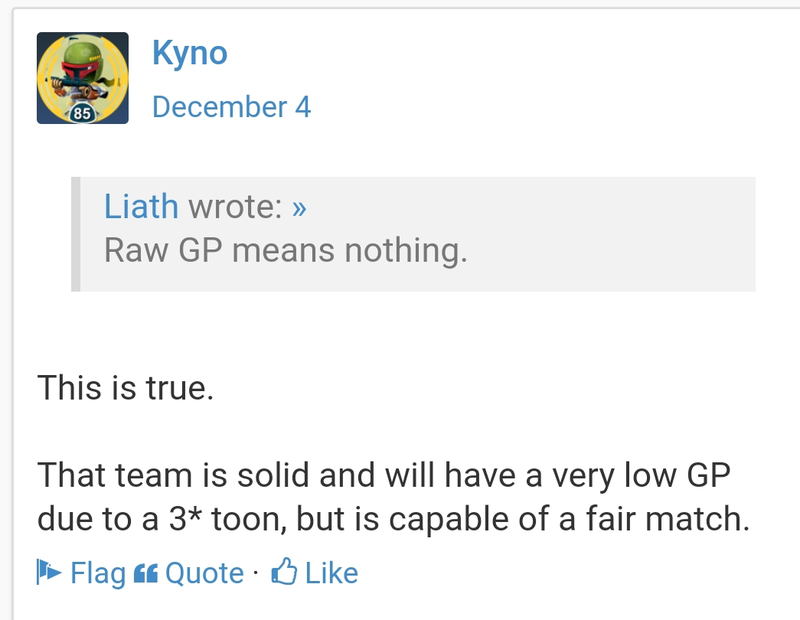 I also agree matchmaking shouldn't be based on WHICH g12 toons you have, just how many. This whole conversation is like me complaining that I haven’t put in enough work for ships to be super competitive in fleet arena. Just because you didn’t focus on TW esque teams, doesn’t mean the game is over. Grand Arena isn’t perfect, but neither is the people who compain about it’s approach to the game. The New England Patriots have anfabtastic scouting staff, they manage their salary cap very well and invest resources in bringing in and developing new players..... They win lots of superbowls.... The Cleveland Browns get high first round draft picks every year and they squander it on junk and have a terrible coaching and scouting strategy.... They stink.... Should the Browns only have to face weak teams so they get more wins and make the playoffs? When the pairings are this lopsided, all anybody is getting, win or lose, is a participation trophy. Sign up, post a nominal defense, maybe waste a few attacks, receive the preordained rewards in your inbox. I’m the one asking for real competition here. You’re the one who thinks we should be getting rewards just for signing up. How does gearing things to g7-8 with stuff I already have, have to put no investment whatsoever in impact my ability to gear toons to 12? I did make best use of my resources, these 2 things aren't mutually exclusive, in fact in most cases one has no bearing on other at all..... Think about that for a minute. Just have fun! People are getting way to worked up over this.